Because this is a quite frequently used type of lease it is good to get an understanding of how to apply IFRS 16 on a car lease. This includes all the detailed calculations in spreadsheet examples (including Excel functions used) needed to record the correct entries. The lease payment includes the payment of interest and principal and is an operating lease that includes car related taxes, maintenance and repairs, car insurance, administration and management fees. The total operating lease payment is EUR 475.00/month, of which EUR 243.92 is related to all the car expenses, the remainder of EUR 231.08 is only principal and interest. It is expected that the car will be used on an average kilometrage of 1,250km/month, or in total 60,000km in 4 years. A grid provides a framework in the event of changes in the contract duration or the number of kilometers driven. Excess mileage will be charged at EUR 0.0172/km over 60,000km, lower mileage will be reimbursed at 0.0105/km reimbursement. To not over-complicate the case, it is assumed that the contract will be used for exactly 60,000km. 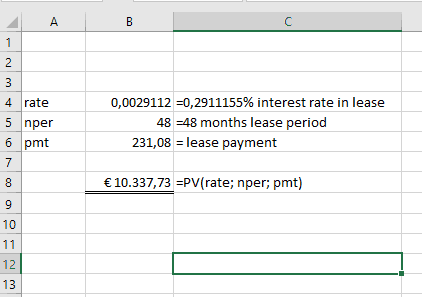 In the agreement a rate table (the grid) is included that details the grid points (which is the monthly lease payment) applied to a specific duration (in months) and a specific annual kilometrage. This grid provides the lessee additional flexibility regarding the duration of the lease and the number of kilometers driven on an annual basis. This grid might become important in accounting for this car lease contract. 48 * EUR 231.08= EUR 11,094.84 (interest and principal) -/- 8,760.33 (principal) = EUR 2,331.51 (interest component). 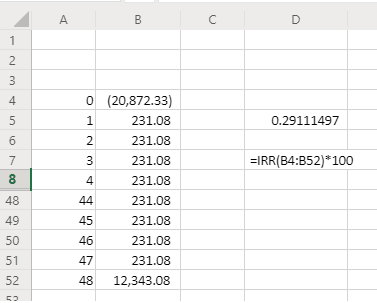 In a spreadsheet (Excel) the internal rate of return can be calculated as a series of 1 receipt (at #0) of the value of the car (EUR 20,872.33), 48 payments (#1 – #47 0f EUR 231.08 and #48 EUR 12,343.08 (EUR 231.08 plus 12,112.00 residual value) with the function =IRR(values), this results in an interest rate implicit in the lease of 0.291115%. See picture of the sheet (in part) below. Depending on the details in the car lease contract it could be necessary to add some initial direct costs or deduct some direct benefits, to get to the final initial value of the right-of-use asset. That is not the case here. As a result the right-to-use asset and the related lease liability have the same value. The payment will be made at the end of March 2017, as lease payments are made each month end. So now the complete asset and liability have to be recognised at the contract date. At the end of the month the first lease payment is made, consisting of interest and principal. The interest component is calculated as EUR 10,337.73 * 0.2911155% = EUR 30.09, the remainder of the monthly payment of EUR 231.08 is redemption of the lease liability. In addition the monthly depreciation of the lease car (right-of-use asset) needs to be recorded. Monthly depreciation calculation: EUR 10,337.73 / 48 months = 215.37.